When a refined version of the designer drug Vertigo hits the streets of Starling City, both Oliver Queen and Detective Quentin Lance have the same idea - question The Count, the drug dealer who created the drug in the first place. They both find that The Count is still incurably insane after getting a taste of his own medicine at the hands of The Hood. Or so it seems before The Count escapes from the psychiatric hospital where he was being kept under observation. As if Ollie didn't have reason enough to track down The Count already, the investigation into where the drugs are coming from points toward his own nightclub and his best friend, Tommy Merlyn. Could Tommy have fallen back into his old habits of supplying "party favors" for his guests? And can Ollie count on John Diggle - currently distracted by his own investigations into the whereabouts of the assassin Deadshot - to be there when Ollie needs his right-hand man? On the island, Shado tries to teach Ollie something about fighting. Green Arrow: Year One (the island sequences), Green Arrow: The Poison Tomorrow (Oliver struggling to fight a drug-dealing villain after being poisoned) Mike Grell's Green Arrow run (Oliver and Shado training together) and the Batman: Arkham Asylum video game (the sequences of Oliver breaking into and sneaking around the asylum searching for The Count). How does Ollie get out of The Count's cell undetected? For that matter, how did he get in there in the first place? Celina Jade gives a most impressive performance in this, her first extensive appearance on the show. An actress/martial artist/singer/songwriter/model, she certainly looked the part of the martial artist/assassin Shado from the comics. Here, she shows the same grace and poise of that character, whether it is by doing some impressive yoga poses or by calmly teaching an impatient Oliver Queen a seemingly pointless training exercise to strengthen his hands. 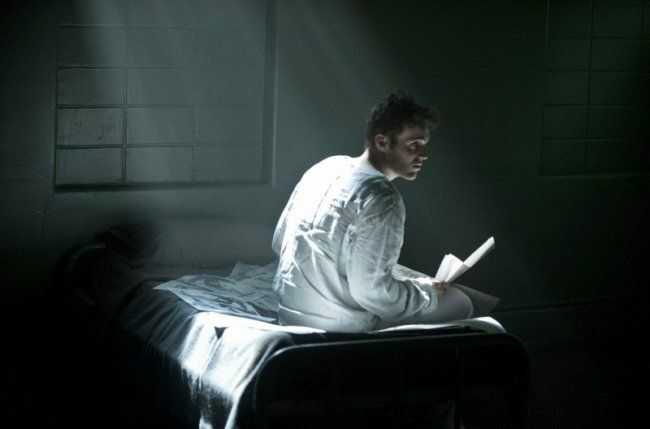 Colin Donnell runs the gamut of emotions in this episode and fully explores just how far the character of Tommy Merlyn has changed over the past six months. The early scene reminds us of the comic figure from the early episodes - the man-child chuckling over the women's underwear left behind at their club. But as the episode continues we see the steel that seems common to the Merlyn family - both in how he sticks up to a bullying Detective Lance and in how he confronts Oliver on his suspicious nature and inability to let others change. Paul Blackthorne spends most of the episode in hardass cop mode but his final scene with Katie Cassidy takes the curse off of it. In an entire episode devoted to the theme of change, it is Detective Lance who undergoes the most subtle changes, finally recognizing his own inability to give up on a good mystery. Ironically, he finds the ability to give up the chase by simultaneously giving up his drinking. David Ramsey gets a bit more time in-action in this episode rather than being the passive voice of reason. It's a change to the regular script formula that works wonders, yet we still get some nice, subtle character moments like the brief scene of John Diggle interacting with his nephew. The cinematography on the final sequence, where the camera slow-pans past a wall at the end of one scene and then moves into the next scene, seemingly on the other side of the wall is interesting. It feels a bit like one is watching a comic book, as the action moves from one panel to the next. Tommy says at the beginning of the episode that they are "in the black and in the green". While he is referring to the nightclub's finances (being in the black means they are making a profit, being in the green means they have lots of cash), it's also a bit of a joke as Green and Black are the main costume colors of Green Arrow and Merlyn respectively. The overdose of Vertigo that The Count received at Oliver Queen's hands caused damage to his "Anterior Cingulate". This is the portion of the brain that handles both automatic functions such as heart-rate regulation and blood-pressure as well as active cognitive responses such as base emotions, empathy, impulse control, decision making and reward anticipation. Ollie makes use of an explosive arrow to take out the Vertigo dealer's car. Later, he uses a hand-held trigger to remotely detonate one of the explosive arrows in his quiver to create a distraction after being captured by the Vertigo dealers. The new Vertigo formula is mixed with Chlorpromazine. It's described as an anti-psychotic medication. While this is technically true, the drug - marketed as Thorazine in the United States - has fallen out of favor in recent years. Ollie: (examining the club's lost and found box) What sort of business has a 'Lost and Found' that's just filled with women's underwear? Tommy: The best business ever! (sighs happily) Having this much fun should be against the law. Det. Lance: You could have just said he was nuts. Diggle: Alright. The person of color has successfully purchased our drugs. Felicity: For the record, I offered. Tommy: Is there something you want to say to me? Tommy: No. I meant the thing that you were thinking when Lance accused me of dealing out of the club. Ollie: I don't understand why you wouldn't just tell me about the bribe. Tommy: I run the club, Oliver! I don't tell you a lot of things! (hits the bar) So let me ask you a question, pal. What have I done in the last six months since you've been home that would lead you to believe that I would sell drugs? Tommy: And so did you, Oliver! But I changed! Just like you did! Now you put arrows in people who do illegal things. Last time I checked bribing a city inspector was not legal. Ollie: Do you actually think that I could hurt you? Tommy: Truthfully, I have no idea what the hell you would do. You are a complete mystery to me. I've got no idea how you find it so easy to kill people. The next time that you decide to think the worst of me, imagine what I now think of you. Ollie's table-flip at the end of the first sequence just looks silly. Emily Bett Rickards' delivery during the bit where she questions Ollie as to why he's making an antidote for the Vertigo user taking hostages at the aquarium rather than just killing him is incredibly flat and passionless. Kristen Stewart flat and passionless. The whole sequence where Ollie is chasing after the Vertigo user who freaked out while at the aquarium seems somewhat laughable when you consider that Ollie is shouting "Stop! I don't want to hurt you! ", in his modulated Batman voice, to the man he knows is tripping balls on a powerful hallucinogen and, oh yes, WHOM OLLIE JUST SHOT THROUGH THE HAND WITH AN ARROW! The Count appears for the first time since Vertigo (112). Deadshot has killed a Senator since the last time he was seen in the news (117). Diggle's nephew appears for the first time and apparently he loves having his uncle read him stories at bedtime. Felicity is still analyzing The Sign (here referred to as 'The Glyph) from 118. Diggle meets once more with Lyla - the old army buddy now working with intelligence first seen in Arrow #25. This time we find out what organization she is with - ARGUS. Yao Fei was a general in the People's Liberation Army, who was framed for a massacre by the Chinese Military and sentenced to The Island for life. Eddie Fyers's plans involve using Yao Fei as a scapegoat for whatever he and his men are doing. Shado spent several years trying to find Yao Fei before being captured by Fyers' men. Tommy quits his job as General Manger of Verdant and meets with his father to ask for a real job. Oliver agrees to help Diggle with tracking down Deadshot. Laurel doesn't really have any purpose in this story other than offering emotional support to her father and her boyfriend. At least she's fierce in standing up to her father and defending her boyfriend but she really hasn't had a storyline focused on her in a while. Ollie's standing around in an moderately well-lit alley with his hood down while waiting for Felicity to call him. An enjoyable episode with a smart script that moves several on-going plots forward without feeling like it is tackling too much.